Home Revolution 2 Replacement Pre-Filters, Fits Dyson DC58, DC59, DC61, DC62, SV03, V6, V7, V8 Series Animal and Motorhead Models & Part 965661-01 by Home Revolution at Animal Backgrounds. MPN: 836298. Hurry! Limited time offer. Offer valid only while supplies last. Home Revolution Brand provides High-Quality Replacement Pre-Filters for your Dyson DC58, DC59, DC61, DC62, SV03, V6, V7, V8 Series Vacuum Cleaner. 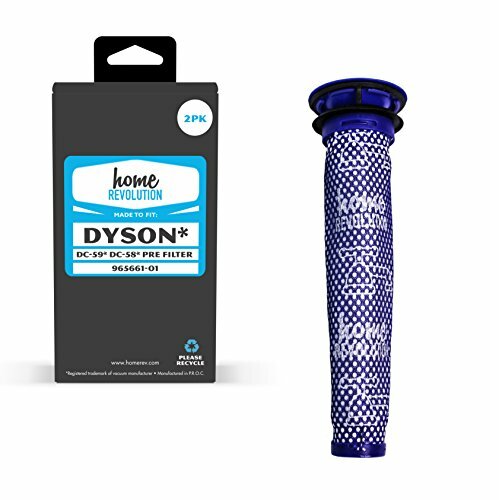 Home Revolution Brand provides High-Quality Replacement Pre-Filters for your Dyson DC58, DC59, DC61, DC62, SV03, V6, V7, V8 Series Vacuum Cleaner. Made to Fit the following models:DC59 Animal, DC59 Animal Complete, DC59 Animal Exclusive, DC59 Animal Exclusive, DC59 Animal V6, DC59 Motorhead, Dyson V6 Animal, Dyson V6 Animal, Dyson V6 Animal, Dyson V6 Motorhead, Dyson V6 Motorhead Exclusive, Dyson V6 Motorhead Exclusive, Dyson V6 Motorhead Exclusive and V6 Animal Extra. Compare to Part # 965661-01.